The Waverly Christian & Missionary Alliance Church is pleased to be able to take part in the Valley Family Fun Day, coming up on July 28th from 12pm-5pm. Please make plans to attend and join us for the afternoon! 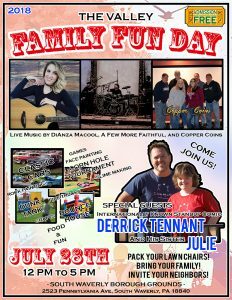 The Valley Family Fun Day is a FREE multi-band outdoor community event that is being held on Saturday, July 28th from 12pm-5pm. Activities for all ages, including a bounce house, dunk tank, a corn hole tournament, a classic car show, fire trucks, motorcycles, face painting, rock painting, slime making, crafts, Stray Haven, etc. Mark your calendars, bring your family, friends, neighbors, chairs, and come on out for a great day! Games, food, fun, and much more! Live music by DiAnza Macool, A Few More Faithful, and Copper Coins. Special guest speakers, internationally known stand-up comic, Derrick Tennant and his sister Julie.